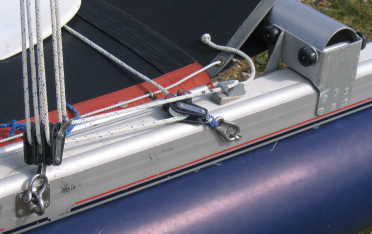 This page looks at setting up the mast (shroud tension and rake, further below) and shroud control through the mast heeling line. 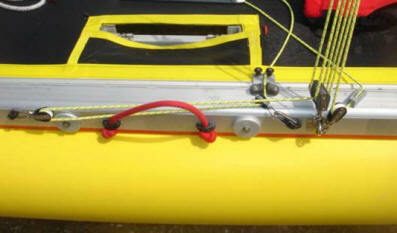 Catapult's unique shroud control (to assist rigging and allow capsize recovery) uses a 6 X 1 tackle at the bottom of each shroud (pictured below) with a single line for both, running across the boat. To heel the mast, one tackle is slackened while the other is pulled in. Most boats are set up with the line running across the boat a little aft of the dagger-boards. 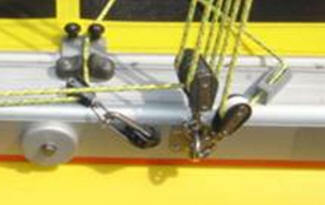 John Peperell writes on THE MAST HEELING LINE -FORWARD OR AFT? Most of us have experienced this � you are doing well on the first beat and you have the inside slot with the windward mark coming up fast � its great isn�t it! You put in a neat tack and bu**er � your foot fouls the heel line & the rig uncleats!! It�s so frustrating � all that hard work on the beat gone to waste! However Jon Montgomery never supported this arrangement - his objection was that the line was now out of reach if you are in the water aft of the shrouds, as you likely to be after capsize. In the end Topper kept to JM�s original design and to help Jon added fair leads inboard (see below) to minimise accidents. This worked well for me if the shrouds were kept fairly tight but we all know that a lot more power can be generated if the shrouds are slack. With the slack rig set up, I struggled to keep the heel line cleated in the heat of a race. So last winter I gave the heel system some more thought and came up with a new arrangement pictured below. As can be seen with my arrangement the heel line now crosses the deck forward of the dagger boards and so is much less prone to accidental tripping. Also the heeling system can worked from a position aft of the shrouds and if on capsize you find yourself forward of the shrouds then my arrangement is also convenient to use. Its nice to think that JM might just have approved of my new heel line arrangement. This makes it simple to finally tension the shrouds after setting the mast up with loose shrouds. The picture left also shows Alastair's use of the solution which John describes in the article above, with the heel line led forward rather than back from the blocks, running across the boat a little aft of the forward cross-beam. Everyone agrees that it is essential that the rig is not set up so tight that mast rotation is restricted, as an un-rotated mast drastically cuts power and speed until it is noticed and pushed around. This also needs a smooth mast ball, well-lubricated. 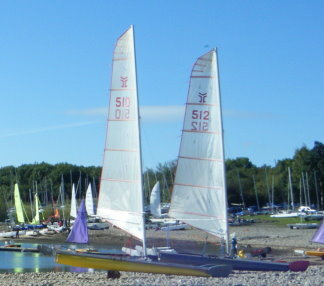 Beyond this, some are confident that the boat goes best with the shrouds a little slack (about 6 inches easy movement sideways at shoulder height) while others argue that only ensuring the mast rotation is the key. The photo right gives an idea of the 6 degrees of rake most use, as the designer recommended. In heavy winds, there is so much going on that seeing a difference may be lost, and the advantage of less pressure on the bows may be offset by less responsive tacking. So at the moment I have given this up"
Others may have other ideas on adjusting mast rake, but sticking to the 6 degrees above seems best.